When I think of Fox's, I think of pizza. I guess that's why it wasn't really a lunch stop for us. Pizza is a heavier lunch than our normal fair. With the loss of our in-town diner, though, we've been doing more exploring and we like Fox's wraps as a lunch alternative. They have a club wrap that has turkey, ham, bacon bits, cheese, and lettuce. We have them hold the mayo and it's a nice light lunch. The wraps are $5.99 and they are big. The folks in my office have always gotten Fox's sandwiches and pizza delivered on cold or rainy days. 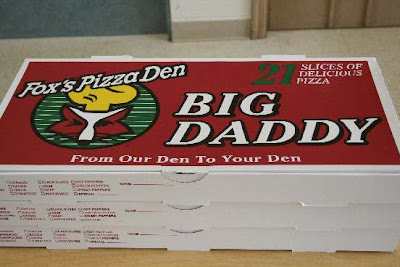 The Big Daddy is a great value and if you have lots of hungry mouths to feed, a few of them on the table will do the job.